The Speedy may have been the darling of the early aughts, the Twist the logo favorite of recent years, but it’s the Neverfull that remains, after ten years on the market, one of Louis Vuitton’s most popular handbags and the ultimate workhorse. With an easy silhouette made in flexible materials, the minimalist tote is truly never full, allowing owners to pack huge loads into its lightweight frame. Even with 0.5″ handles, the medium size, the MM, is durable enough to hold a weight of up to 200 lbs. Of course, for all its success, the Neverfull has brought about a slew of imposters trying to cash in on its popularity. 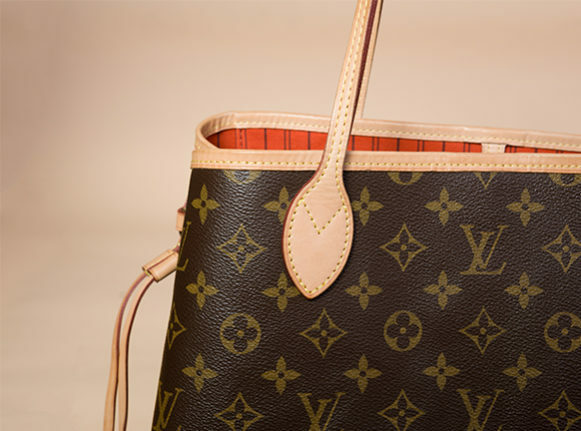 “Sometimes we’ll see a counterfeit of a version that’s never even existed, like a Neverfull in monogram vernis,” says Senior Authentication Director Graham Wetzbarger. “At the airport just the other day I saw one in Damier Graphite, which is a material reserved only for men’s items, and since the Neverfull is sold exclusively as a women’s handbag, we know it was never made in that material.” For more on how to tell if your Neverfull is the real thing, read our expert’s tips below. 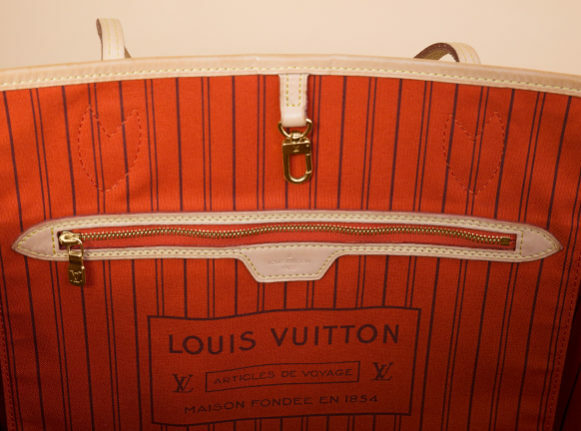 As with many other Louis Vuitton handbags, the Neverfull handles are made from an untreated calf hide called vachetta. “Fakes will use a material that’s either a treated leather or a faux leather, so it doesn’t age the same way vachetta does or it doesn’t age at all,” explains Wetzbarger. While tan vachetta will develop a patina from the oils in your hands, a counterfeiter may use a different material that doesn’t darken with age — a clear sign the piece is inauthentic. “It’s also important to pay attention to the casework or glazing on the edges. It should be clean and have a subtle red tone; often on counterfeits the casing is a very bright orange or crayola red and it’s very waxy and sloppily painted,” says Wetzbarger. Like all Louis Vuitton handbags and accessories, the Neverfull has a date code, which indicates the month, year and location where the bag was made. Starting in 2007 (the year the Neverfull was released), the second and fourth digits of all codes correspond to the production year, while the first and third digits refer to the week. For instance, the code FL2153 would indicate the piece was made in the 25th week of 2013. “On every Neverfull, you’ll find the leather date code tab under the right-hand corner of the interior pocket, regardless of size or material,” explains Wetzbarger. The NM version, also known as the Neverfull Neo, was released in 2014 and comes with a removable pochette which also contains a date code in the lining seam, as seen in the image above. If the date code on your bag indicates it was made before 2014 but was accompanied by a removable pocket bag, this may be a sign it is inauthentic. Ready to score one of your own? Shop our authentic selection of Neverfull bags here.